Two massacre events today. One in Mesa AZ, the other in Tunis, Tunisia. This prompts me to look for a moderately strong expression of the Bloodbath Formula. I can't find an incident time for the more severe Tunis event, so we'll look at the Mesa chart. 2. 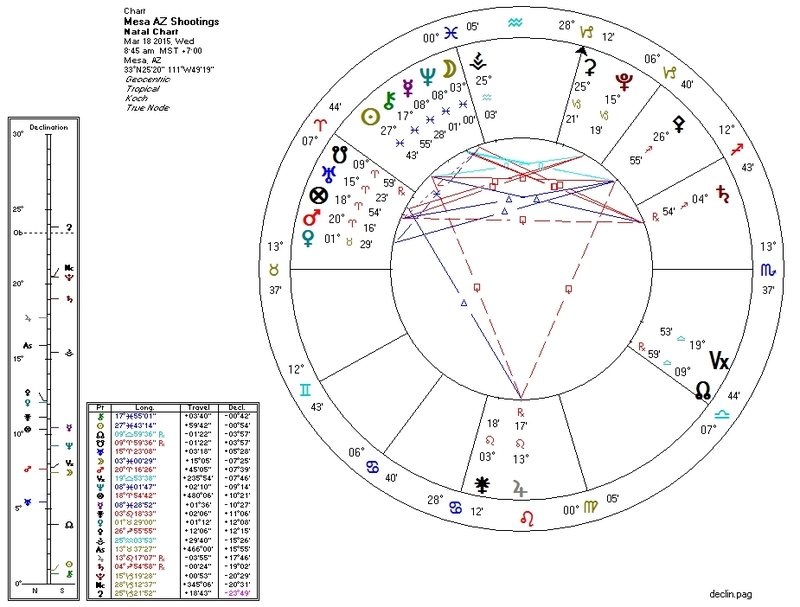 Venus in 12th House: 2nd House ruler Mercury conjunct Neptune. 3. Venus "squine" and mundane-square Pluto. 4. Moon semisquare Pluto and ruled by Jupiter which is quincunx Pluto. As a "bonus" on this bloody day, Benjamin Netanyahu won re-election yesterday in Israel.